There may come a time when you don’t want someone on Facebook to see your interests section. Interests are sorted into categories like Movies, Music, Books, and so on. For your TV Shows section, for example, you can add TV shows that you’ve watched, TV shows that you want to watch, and TV shows that you like. Each time you add a TV show to the list of shows you’ve watched or want to watch, you can also control who sees that you’ve added that particular show to that list. You can open this Privacy menu by hovering over the show’s image and then clicking the privacy icon that appeared beneath it. Make sure you’re looking at the correct section on your screen. Click the pencil icon button in the upper-right corner of the box. A menu of options related to this section appears. In the section of the window labeled Likes, click the Privacy menu. 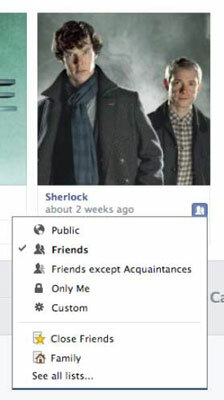 The familiar Privacy menu appears with these options: Everyone, Friends, Friends Except Acquaintances, Only Me, Custom, or Lists. Choose who can see the TV shows you have liked. The changes are saved when you click Close.